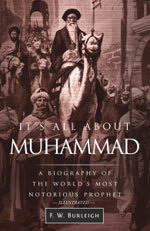 It’s All About Muhammad is based almost entirely on the original literature of Islam: the biography by Ibn Ishaq, the history of Tabari, the collections of traditions of Bukhari, Muslim, and Abu Dawud, and the work of Waqidi and his student Ibn Sad — canonical sources one and all. Many other important sources were also referred to, among them the Koran commentary and the biography by the 14th century scholar Ibn Kathir. All these works are amply cited in the chapter notes. In all, twenty thousand pages of material were given line-by-line scrutiny. If readers find the Muhammad of this biography disturbing, it is because what is written about him in the original literature is disturbing. He was beyond all doubt an extremely violent man, and stories about his violence are found throughout the literature. Indeed, more than two-thirds of the canonical biographical materials have to do with the violence he used to spread his religion. What is interesting is that none of the original writers seem to have been disturbed by this. They were committed believers who swore by the first “pillar” of Islam, the primary declaration of faith: “There is but one God, and Muhammad is his messenger.” They were convinced Muhammad could do no wrong since all that he did was in furtherance of “Allah’s cause,” so they faithfully reported all that he did no matter how chilling, no matter how cold-blooded. In so doing, they provided abundant evidence of crimes of assassination, mass murder, plunder, enslavement, torture, and more. If these historical records are as authentic as Muslims believe them to be, Muhammad committed almost every crime listed by the International Criminal Court as as a crime against humanity. Muslims are obligated by their faith to follow the diktats of Muhammad’s Koran. Many of his verses were intended as incitements to commit violence against people who rejected him. Muslims are also obligated to follow his example in all things — his Sunna. This covers a lot of ground, but it includes the example of his brutality against people who refused to accept him and his religion. Muslims are violent because Muhammad was violent, plainly and simply. This has been so since the beginning of what he created fourteen hundred years ago, and this will continue for as long as what he created is allowed to continue. Muhammad’s penchant for violence was abnormal and needs to be explained. 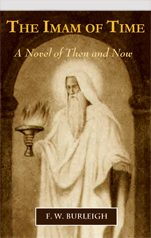 As this book will show, it was likely the product of an epileptic temporal lobe that gave him feelings of communing with the divine joined with a pathological psychology. He believed God commanded him to do whatever he did, no matter how ungodly, and he was obedient to his Lord. The evidence that he suffered from epileptic seizures can be found in the literature: instances of falling to the ground, visions of light that dazzled before him or of objects that remained in front of him no matter which direction he turned. In one of these episodes, the froth of saliva spotted his cheeks. These are classic symptoms of the falling sickness, as epilepsy has been called. Even his contemporaries thought he was devil possessed — the ancient explanation for epilepsy. That his epileptic experiences led him to believe God talked to him is one of the important themes of this book. Another is that he was a psychopath, the product of unfortunate early life circumstances that he did not choose, but were imposed on him. His early childhood is explored in the book. He is understandable. He was a victim, but then became a victimizer. There are precise, scientific terms for his psychological complexities, but psychopath is a useful catch-all that does the chore of conveying that there was something dangerously flawed about him. What word but psychopath applies to a man who once directed the beheading of as many as nine hundred men and boys — one per minute for a solid fifteen hours — because they refused to accept him as their prophet? Hands tied behind their backs, they were dragged to the edge of a trench, and two of Muhammad’s first cousins chopped their heads off while he sat nearby and watched. He was a cold-blooded killer, cruel and heartless to people who rejected him. In short, a psychopath. These themes intertwine like conjoined twins that can never be separated. His epileptic experiences brought him to believe God talked to him; the psychopath in him led him to kill people who refused to believe it. The resulting terror he created was the key to his success in imposing his religion, which was the product of his epileptic delusions. This book contains twenty-five illustrations, all of them scenes inspired by the original literature. Half of them are graphic renditions of atrocities Muhammad committed. Muslims have a ban against “depicting” their prophet, and it is easy to see why: The truth about him is horrific, and depicting him opens up a Pandora’s Box. A lot of headless bodies are stuffed inside that box. If you have no prior knowledge of this subject, it is possible to get a good idea about Muhammad and what he created just by examining these illustrations and reading the captions. Better yet is to read the entire book, including the chapter notes. There is a great benefit in doing so. Many words that are usually found in writings about Muhammad are omitted in this work. Take the word “revelation,” for example. The standard wording — even in books and articles authored by people who should know better — is that God “revealed” the Koran to Muhammad; he received “revelations”; God “handed down” verses to him, and so forth. The use of the word revelation in a book or article about Muhammad establishes that the author believes or gives credibility to the idea that Muhammad was divinely inspired. This, of course, is nonsense. If there truly were a God capable of coming up with what is in the Koran and transmitting it to a someone like Muhammad, all creation would rise up in rebellion. The phraseology of this book is disciplined: Muhammad was the author the Koran. He “came up” with verses; he “composed” verses. The Koran was his handiwork, his composition. These are plain, simple, and true statements, and these are the words used in this book to express the straightforward truth. There are other offender words that are omitted, the greatest being the words “Islam” and “Muslim.” Other than in this introduction, in quotations, or in the titles of books in the bibliography and chapter notes, these words are scrupulously avoided. This is because they contain a false idea. Islam means submission to God’s will. What is false about this is that Muslims do not worship God. This is a truth that is not generally understood. What they worship is a God concept and nothing more, a concept that was created by Muhammad. And who was Muhammad? An epileptic psychopath, a man who murdered nine hundred men and boys in cold blood, one of a great number of horrific crimes against humanity he committed. His God concept was a reflection of who he was. He was violent and intolerant; his Allah is violent and intolerant. He had a magma chamber of hatred burning inside of him; his Allah erupts with it. He projected himself onto the cosmic screen and proclaimed the image to be God. The same problem arises with the word “Muslim.” It means a person who submits to God’s will. The spectacle can be seen everywhere of people bowing down and touching or even banging their heads on the ground. They have been conditioned to think they are praying to God, but they are deceived. They worship a God concept formulated by an epileptic psychopath, a deluded mass murderer. This book has labored to avoid such words because their use gives an endorsement, however unwitting, to the false idea they contain. Muhammadan and Muhammadanism are old words that have fallen out of use, but they are honest words, like saying Christian and Christianity in connection with what Jesus created, or Buddhist and Buddhism for what the Buddha inspired, and so forth. In the end, this book settles on “what Muhammad created” as the most honest formulation. Why should you read this book? Blood, that’s why, eventually even yours or that of your descendants. Around the globe people who follow in the footsteps of their master continue to kill people who do not. By some estimates—made before the slaughter of Christians, Yazidis, and others began in Syria and Iraq — someone was getting murdered somewhere in the world every thirty minutes by people who have been brainwashed into believing that God talked to Muhammad and instructed him to kill people who refused to pronounce the words of the first pillar of Islam: There is but one God, and Muhammad is his messenger. As the events of the Middle East portend, the slaughter will get worse over time, and after it gets worse, it will get even worse than before. It will threaten you and everything you believe in unless you do something about it. This book is prescriptive. It is not the intention for readers merely to walk away shaking their heads and saying, “How awful. How terrible!” It gives a way out; it offers an avenue for doing something about it. What Muhammad created can be gotten rid of. It is an aberration. It is evil overturning good and claiming to be what is good. It was imposed by violence, for there was no other way for it to succeed; it continues through violence, because it has no other way to sustain itself. But you do not have to continue putting up with it. You do not have to be its victim. Muhammad was not born in the full light of history, as has been claimed. He was born shrouded in the fog of mythology, hidden in a mist of lies. Blow away the fog and the mist and expose him to the light of reason and common sense and what he created will die an overdue death. This is already happening to some extent, but it needs an accelerant. The accelerant is discussed in the Epilogue. It’s All About Muhammad is a book of revelation. It reveals what needs to be revealed about one of the most disruptive and sinister personalities of history, and it reveals what can be done about what he created. If you have doubts about any of this, then all the more reason to read on.